Lien Chen-Ling made history on day one of the International Judo Federation (IJF) Grand Prix in Budapest after winning Chinese Taipei’s first-ever gold medal in the sport's flagship series. The Asian Championships silver medallist was victorious against Germany's Samsun Grand Prix winner Viola Waechter in the women's under 57 kilogram final as she scored a waza-ari and then a yuko from an ouchi-gari. She is now looking ahead to August’s World Judo Championships in Kazakhstan, where she is hoping for more success. “I am so happy to win my first Grand Prix gold medal and the first for my country is something I am so proud of,” said Lien. The first bronze medal was won by Japan’s Momo Tamaoki against Tashkent Grand Prix silver medallist Camila Minakawa of Israel, while the second was won by the United States’ Marti Malloy after a titanic tussle against Dusseldorf Grand Prix bronze medallist Karakas Hedvig of Hungary. 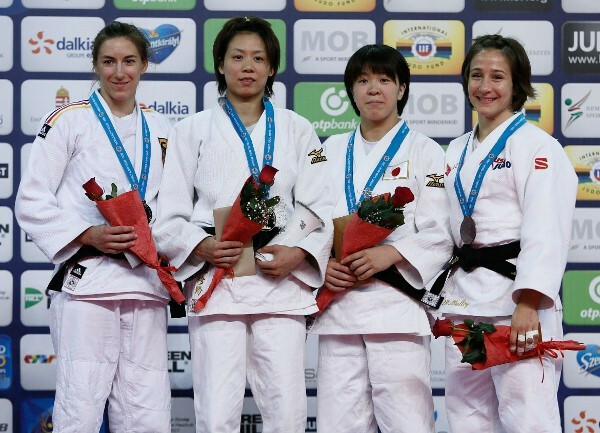 Elsewhere in the women's competititon, Sofia European Open silver medallist Tonaki Funa of Japan won the first IJF medal of her career as she starred in the lightest category of the competition. But the gold medal went to Beijing 2008 Olympic bronze medallist Paula Pareto of Argentina. The 29-year-old world silver medallist, fifth at London 2012, proved too much for the 19-year-old Japanese newcomer who was caught with a ko-uchi-makikomi for a yuko score to secure gold and with it 300 world ranking points. The first bronze medal was awarded to former Baku Grand Slam bronze medallist Nataliya Kondratyeva of Russia as she beat Cuba's Mestre Alvarez. The second bronze medal was won by three-time African champion Taciana Lime-Balde of Guinea-Bissau, defeating Dilara Lokmanhekim of Turkey by ippon after 61 seconds. There were also wins for Germany’s Mareen Kraeh and Slovenia’s Tina Trstenjak in the under 52kg and under 63kg category finals respectively. Kraeh beat compatriot Maria Ertl as Spain’s Laura Gomez and Portugal’s Joana Ramos took the bronze medals. Trstenjak defeated Russia’s Pari Surakatova with Sweden’s Anna Bernholm and Mia Hermansson rounding off the podium. Olympic silver medallist Miklos Ungvari was Hungary’s top performer on the opening day as former European champion Rok Draksic of Slovenia fell to the 34-year-old home fighter in the men's under 73kg final. Draksic, winner of European gold in Budapest two years ago, went behind to a yuko before being held down with a tate-shiho-gatame, and the Slovenian tapped out with 50 seconds left. The first bronze medal was won by Belgium’s Dirk Van Tichelt, who defeated Minsk European Open bronze medallist Igor Wandtke of Germany by ippon after three minutes, while the second bronze medal went to America's Nicholas Delpopolo, who won by a waza-ari against Sweden’s Tommy Macias. Kazakhstan’s Yeldos Smetov was the star man in the under 60kg category as he beat team mate Imashev Aibek, and there was further success for the country as Smagulov Zhansay overcame Germany’s Sebastian Seidl in the under 66kg final. Japan’s Shishime Toru and Uzbekistan’s Sharafuddin Lutfillaev claimed the under 60kg bronze medals, while Russia’s Arsen Galstyan and Portugal’s Sergiu Oleinic came away with the under 66kg honours.